This evening the Mules were resting in an open field in Thousand Oaks when a deputy told us we could not camp here. We told him that we were not camping, just staying the night. Since we would not move, I was arrested and jailed, and the mules were sent to Animal Services in Agoura Hills. Released from jail at no cost. The mules were released from animal services after paying $514 fee. About 4pm, while grazing on a vacant lot, we were approached by Ventura City Police, who told us that they knew who we were, and if we stopped within city limits to sleep, it would be considered illegal camping, in which we would be arrested and the mules would be impounded. We moved from this location and were not cited. We are in Ventura as we have a hearing for the Thousand Oaks citation at Superior Court of Ventura County in the morning. The Mules appeared at Superior Court of Ventura County charged with committing an infraction by violating Thousand Oaks Municipal Code Section 5-8.08(c): Unlawful Camping, a misdemeanor (criminal offense). This was reduced to an infraction Thousand Oaks Municipal Code Section 1-2.0I and is considered to be a PUBLIC NUISANCE. The fines were waived by the judge. 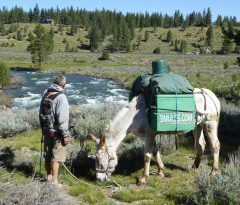 The Mules walking all day peacefully, carrying and spreading the energy of reverence and respect for this beautiful earth and all its inhabitants have now been officially categorized by the Megatropolis as a PUBLIC NUISANCE. The automobile, the Megatropolis’ most valued tool, however, kills and maims hundreds of thousands every year. Killing children walking and riding their bicycles gets by. Nothing is said, no charges. The automobile will certainly never be called a PUBLIC NUISANCE.